With Invisalign's removable aligners, it easy to clean your teeth during your orthodontic treatment. But it’s important that you keep the aligners themselves clean, too! Here’s how to do it. Rinse your aligners every time you take them out. Otherwise, dry saliva and plaque will build up over time, creating the ideal breeding ground for foul smelling bacteria. Always brush and floss your teeth carefully before putting you aligners back in to prevent food particles and bacteria from getting trapped in the tight space between your teeth and aligners. 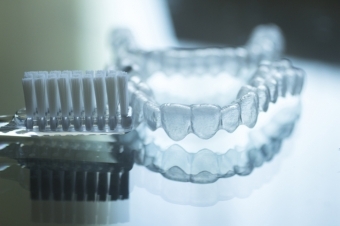 Clean your aligners with clear (never coloured), anti-bacterial soft soap and a soft toothbrush regularly. This is a great way to get rid of unwanted bacteria and keep your aligners clean and smelling fresh. Rinse thoroughly before putting the aligners back in your mouth. Avoid eating or drinking anything other than water while you’re wearing your aligners. Food and drinks can stain your aligners and make them start to smell bad over time. Don't use toothpaste to clean your aligners unless you have to. Toothpaste is abrasive, and may cause your aligners to dull, or develop small scratches that trap bacteria. When you're not wearing your aligners, don’t leave them exposed or uncovered. Always put them right in their case (after a thorough cleaning). Leaving your aligners out in the open exposes them to bacteria, and increases the likelihood that they’ll be damaged or lost.